In his prime, he was brash, charismatic, defiant, incredibly handsome, and a true case study in confidence and a will to win. Today, Ali is a shell of his former self, due to aging and Parkinson’s disease, but he is no less admired, celebrated and loved. He is, in fact, our collective treasure. Director Bill Siegel, fully aware of all these things, wanted us to know more about the man who “shook up the world,” and what that really means, so he created “The Trials of Muhammad Ali,” a documentary that exposes us to an Ali that we may not have known as well. Take a look at the trailer…. 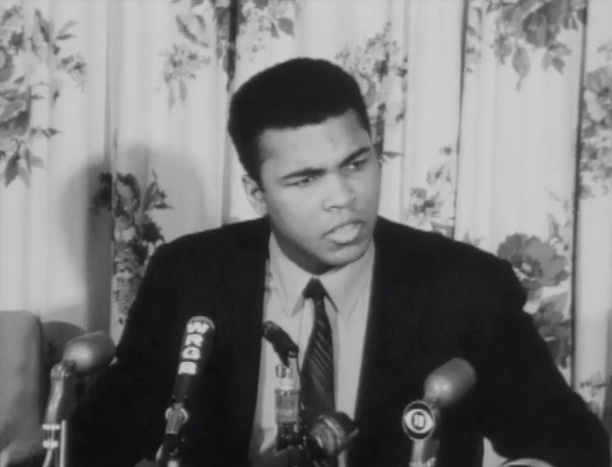 We often look at today’s athlete with a grain of disappointment because they are not nearly as vocal as Ali was about issues that affect their communities, their countries, or the world. While it is each athlete’s prerogative, it would be nice to return to a time when larger than life personas and the platforms on which they are built are used for more than selling a product, or landing on a best-dressed list. With all due respect, there are many players, male and female, who go about their good deeds without desire for fanfare, and that must be commended, but Ali FOUGHT hard and publicly against what he perceived to be wrong, with a vigor that has been missing for years. Films such as “Trials” offer an example of the blueprint for change; we just need new architects. See the film in select theaters beginning mid- September. Lob from Life + Times.